The Oregon Cactus & Succulent Society (OCSS) will hold it's next meeting at the regular meeting place, Sacred Heart Villa, 3911 SE Milwaukie Ave. in Portland, Thursday, April 19, at 7 pm. A guest speaker from the distributors of Black Gold potting mixes will present the main program. In the following photos new member Dee shows off her new club tee shirt and Mark, our new president, listens to ideas from some of the members. Also, we can now announce our June and July Show/Sale dates: June 16 & 17 at the Portland Nursery East parking lot at the Division St. store, and July 20, 21 & 22 in the West Parking lot at the Portland Nursery on Stark St. In either case, we will be under the big awning. We only have limited quantities of this plant which we are working to propagate, but it's slow. It's flowering right now and what a flower. 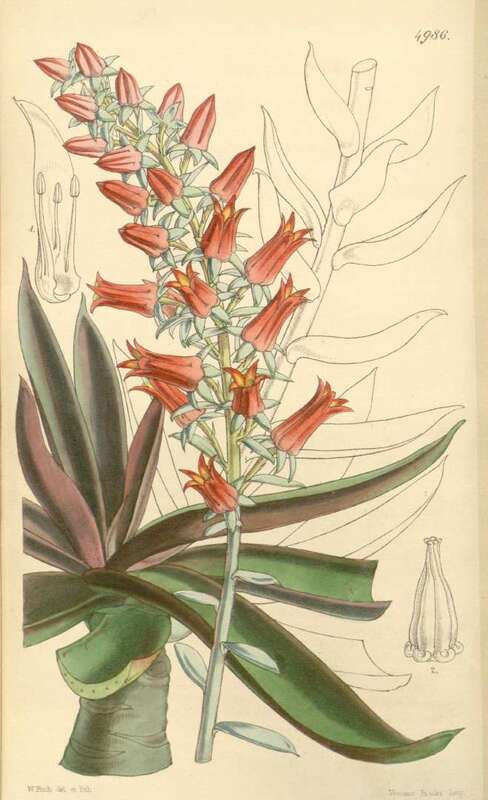 The botanical drawing is from Curtis’s Botanical Magazine, vol. 83 [ser. 3, vol. 13]: t. 4986 (1857) [W.H. Fitch], available online at the website of the Missouri Botanical Garden. Echeveria canaliculata. Quite a handsome plant. This is certainly not the best photo of Bowiea volubilis ever taken, but it certainly shows off its strange inflorescence. 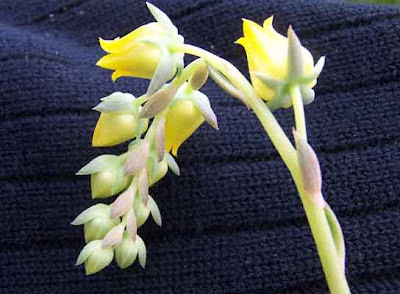 This is an easy succulent bulb to grow and its inflorescence is amazing, especially with the addition of the small, delicate, yellowish-green flowers. OK, so the flowers don't smell the best, but they're small. They won't overwhelm you. I took this picture a couple of weeks ago. It was pretty obvious that Spring was here. The greenhouses were almost getting too hot during the day and the trees are all in blossom. And then tonight. It's snowing. On the first day of Spring, it's snowing. And sticking. About an inch on the ground as I go to bed. Enough already! It's spring! 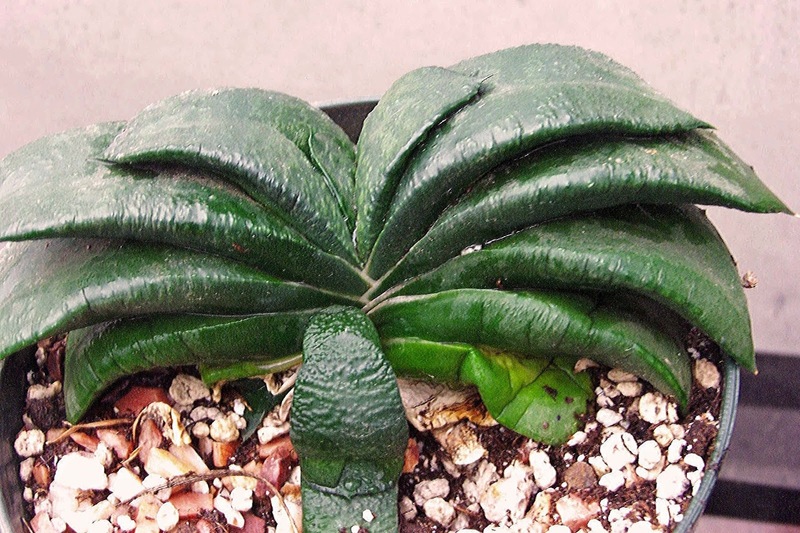 Oh, and yes, these are specimens of Haworthia truncata var maughanii, growing in one of our haworthia trays. I think they want some sunshine too! If anyone is operating under the illusion that we live in an arid climate, this ought to set you straight. This is a photo of one of the variegated box elder trees in our yard. It's hard to find the bark at this time of year for all the moss. These are old trees, planted sometime shortly after the house was built in 1906. Right now we're going through a wet spell, which is pretty normal for this time of year. In the summer, if things are normal, it will be dry. This is the view that Lynn-Marie gets when she's working with the plants: re-potting, propagating, preparing plants for shipment. The plants on the table are there to get closer supervision and the glass of Cabernet to the right is to make the task more pleasant. It doesn't hurt, of course, that it's located directly in front of the heater as well! Hopefully, we won't have to be using it much more this season. I said I was going to post something different than Echeverias today but this is quite a switch. Today I've gone over the edge to some of our old grafts. Nothing soft and "pretty" about these! But they do amaze me. I think that sometime I'm going to have to take some time and do some re-grafting before they're completely overgrown. It's a jumble, all right. Though our Spring flowers are just beginning to show, sometimes it's the combination of plants and flowers which - without any planning - put on quite a show. Plants get placed in the greenhouse where they can get the light they need - or according to where we find room! The result is a bit of a mixed bag which, sometimes, just works. Another Echeveria tonight. This one is Echeveria shaviana 'Pinky'. I could go on and on with just Echeverias and their relatives, but I don't want to bore you, so I'll move on to some other plants tomorrow. Lynn-Marie took this picture the other day. It's a photo of the flower of Pachyveria 'Claire', a gorgeous plant in itself...and then the flowers show up. Thanks to Mark for running a fine meeting tonight at the Oregon Cactus & Succulent Society. Roxanne gave a very nice presentation on Aloes and as of tonight, it appears that we have programs and events planned for almost every month for the rest of the year. This may end up being a new species, but for now it's Echeveria 'Cumbre'. Whatever its name, it's a beautiful plant, currently showing off its Winter colors. Another Echeveria showing it's colors: Echeveria 'Fancy Frills'. There are a lot of Echeveria hybrids which look pretty much the same and there may be an excess of cultivar names floating around out there, often for the same plant. However, this one certainly deserves its name! The Northern night sky is interesting right now with Venus and Jupiter passing closely by each other. And we've had a beautiful full moon lighting up the sky. And Graptoveria 'Moonglow' is looking gorgeous in the greenhouse. How's that for a lead in. These are big, handsome plants, soft but bold, hidden away at the far end of one of the greenhouse aisles. Safely maneuvering down the greenhouse aisle may be a challenge at this time of year, filled as it is with excess plants desperately waiting for some warmer Spring weather so they can go outside, but it's worth the risk. No, these aren't "baby" truncatas. As you can see they are mature, but they aren't very large. Grown from seed collected in habitat, East of Oudtshoorn, Western Cape, South Africa, they tend to stay smaller than the standard strains. And though they usually maintain a rather dark body, we have one that doesn't quite fit in, though grown from the same seed batch. Highly prized for their unique features. 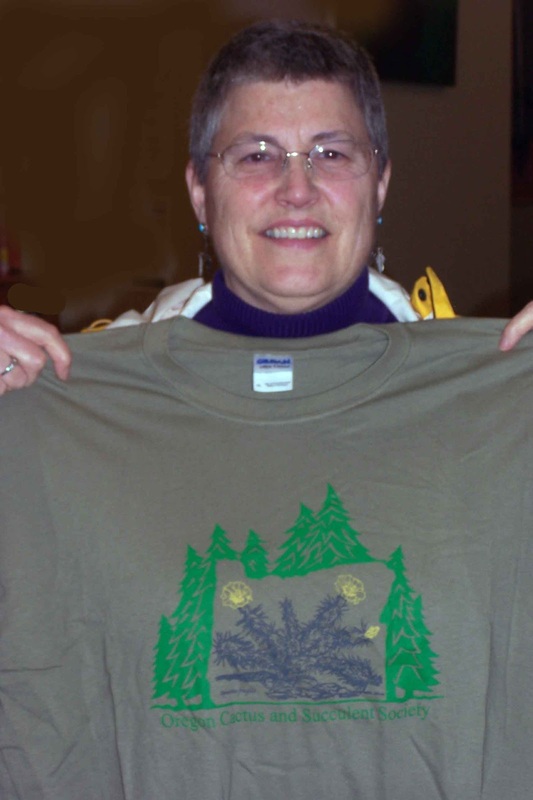 The next meeting of the Oregon Cactus & Succulent Society (OCSS) will be this coming Thursday, March 15, at 7 pm. the meeting will be held at the Sacred Heart Villa, 3911 SE Milwaukee Ave., in Portland. The plants of the month are Aloes and Rhipsalis, Lipismium, etc.. Bring a plant to the brag table. It should be a great meeting - with refreshments of course! We also have some other special announcements regarding upcoming programs and the June and July Sales (with un-judged show at the July sale). Start planning for that special plant you would like to show to the public. I know I posted this last month, but then it was pretending to be Spring. Last week it was pretending to be Winter and we had a light dusting of snow. But of course that doesn't stop these little beauties. They've been blooming for over a month now. It was sunny and beautiful today and a full moon tonight. We got six shipments of plants posted today and we have about 3 or 4 more still to go. Then - perhaps - some R & R.
I'm afraid it was a little late in the day when we got out to take this photo, but it was still showing off its crinkly pedals. Normally, they aren't like this and I don't know why this one is, but it was a nice little oddity. 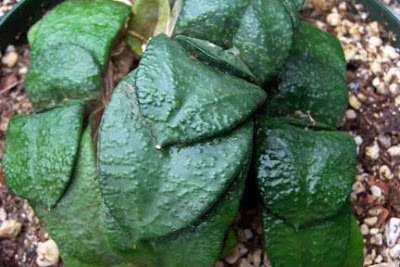 Cheiridopsis candidissima is a really easy succulent to grow, originally from South Africa. We're still getting a few cold nights, but Spring is definitely here! Here's some daffodils from our front yard with a hanging basket of Rhipsalis grandiflora in the background. And then some closer pictures of the Rhipsalis. This hangs in our kitchen window. Thanks to Lynn-Marie for today's photos. Another haworthia tonight: Haworthia cooperi var. venosa (seed grown from GM292 seed). Compare this to yesterday's haworthia. That's one of the things I like about haworthias, the variety of forms within the genus. 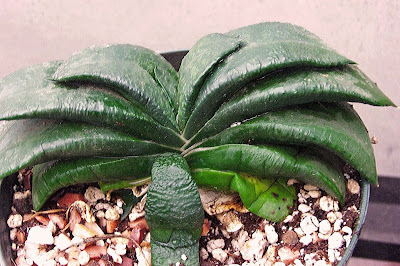 This is Haworthia truncata var. crassa. OK, the "crassa" part isn't accepted by many, but it serves as shorthand for "the big form" of the plant. These have been grown from seed produced from two of the larger plants in David Martin's collection. We've grown them on and they've really become quite nice. Thanks David. It looks like we're in for another cold spell, but nothing like the forecast I mentioned yesterday. It may get down to 30F or so, and maybe a dusting of snow. No big deal. In the meantime, the daffodils are blooming, along with crocus, snowdrops, etc. And the Epis in the greenhouses are beginning to set buds. Echeveria 'Dondo' is a hybrid which blooms about this time of year. The flowers form on short, multiple stalks and are quite colorful. We haven't tested it, but it is supposed to be fairly hardy, surviving cold down to around 20F. I forgot to check the label on this when I took the picture, but who needs a name. The coloration on these plants can be highly variable, depending on the light, temperature and the watering schedule it's on. Sometimes they're just hard to reach an thus get neglected - to their benefit. Need I say anything more? I'll let the plant speak for itself. We're not really collectors of Gasterias, but because of their kinship with haworthias and aloes, we do have a few. We like them. We just don't have enough room. But they're so easy; what's not to like? We bought this many years ago at a California nursery somewhere. We can't remember the name or the location. It's very frustrating. Are we the only ones this happens to?